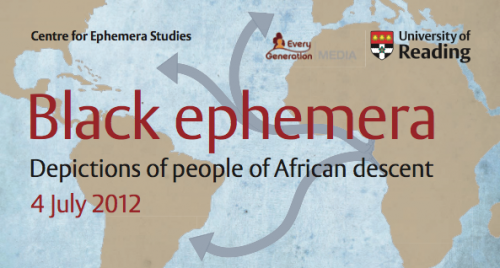 On 4 July 2012, the Centre for Ephemera Studies is holding a study day that will focus on the ways in which black people from the African and Caribbean diaspora have been represented in printed ephemera over the last two hundred years. Beginning with images printed before the abolition of slavery, ephemera have provided various opportunities for advertisers and others to depict black people unfavourably for their own ends, including packaging, advertising, trade cards, sheet music, postcards and greetings cards. With contributions by twelve speakers – including historians of black culture, curators, ephemerists, and those concerned with community relations and racial equality – the study day will discuss the graphic and verbal stereotyping that resulted from these practices. An exhibition of ‘black ephemera’ will illustrate some of the most common, and troubling, forms of stereotyping, and will provide a backdrop for discussions. This one-day symposium (starting at 10.30am, until early evening on Wednesday 4 July) will cost £50 to attend, including lunch. If you would like to attend, please email Diane Bilbey (d.j.bilbey@reading.ac.uk). Further details and booking form are here: Black ephemera study day.